I had just turned 9 years old when my brother and I were found abandoned in an apartment. Luckily we found our way to Great Plains SPCA in Merriam and that is where my forever story begins. My brother, Spock, was already living with a nice foster family while he was receiving medical treatment for anemia. 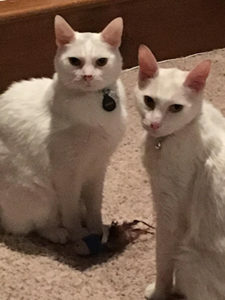 I wanted to be back with my brother, but I couldn’t until I was stable enough from my renal failure (secondary to severe dehydration when we were abandoned). Spock’s foster mom was hesitant to have another medical foster since I was on medications, fluids, bowel issues and had a skin condition, but I was so handsome that she couldn’t say no. My brother and I are both handsome and love to cuddle and ride on mom’s shoulders. I ended up living with my foster mom for a month before she officially adopted Spock. Apparently, he had her wrapped around his little toe. I, however, was struggling with getting my health under control. My kidneys were continuing to fail, my fur was falling out, my muscles were weak and I was very thin. Despite my condition, mom (that’s what I call her now) wanted me to never be abandoned again and to come live forever with her and Spock. My weight was continuing to decline when I reached a tiny 5 pounds and was told that my kidneys were not functioning. Mom said that I kept looking at her like I wasn’t ready to leave yet. Mom had heard about Primal Freeze Dried Nuggets from a friend of hers that also had a kitty with renal disease. Mom was willing to try anything at this point to get me to eat. So she went to Four Paws Pantry and got me some of the amazing chicken and salmon nuggets from Primal. And… I loved it! She would start with one nugget, then two but I would just keep eating! This stuff was so good and I felt so much better with nutritious calories in my tummy! After a month on Primal my fur was shiny, I had gained back a pound and I began to play more. Now I am back jumping on mom’s shoulders. I know that my kidney failure will not completely resolve but I am so grateful that mom found the Primal nuggets. They have made me stronger and I can continue to live my life happy and playful with my mom and Spock.